I still remember the sting. The first time someone asked me, "Why don't y'all start trying to have kids?" after our miscarriage. What stung even more was the realization that in my ignorance, I had said the exact same phrase to others in the past, that I now know were struggling with loss or infertility. Have you felt this sting before? The truth is our world is messy and there are a whole bunch of situations that we as humans don't know how to address… or don't even realize there is a problem with the way we are addressing them. And to be honest we are generally consumed with our own lives and don't think about how others might react to our comments or questions. This got me thinking… how should we handle these situations when we are on the receiving end? When words have cut us and the other party is clueless to the pain they have caused. 1. Give grace to the person who made the comments. Chances are the person who made the comment did not know that they were saying something hurtful. 2. Share with them how their comments were not appropriate. I don't think this is being too confrontational if you go about it with truth and love. Just gently explain how the comment could be hurtful. For example when someone would ask us about when we were going to try to start having kids after our miscarriage (or even now to be honest), I would say something to the extent of, "I just wanted to let you know that that can be a really sensitive question. People could be struggling with loss through miscarriage or infertility. It is really better to just let someone offer the information if they feel comfortable." I usually add a bit of our story because I am comfortable sharing and I think it helps people understand. 3. As you process become more open about your experiences. The more we share, the more people understand. Sometimes people ask why I have shared the story of how we lost our first child through a miscarriage on the blog. First, I can't tell you the number of people that have contacted me about their experiences and God has use me to be an encouragement to them. Second, as I share, people simply become more aware. 4. Let yourself process the situation. Too painful to comment? Take time. Embrace comfort from God. Seek encouragement from others. What do you think? Am I missing anything? Anything else? I think number 1 is so true. So often people make comments to others without even thinking or considering how rude it could be. At work the other day, a lady asked a pregnant employee how far along she was, and the answer was 25 weeks. Her response was, "Don't you think you're kind of big?" The pregnant woman is having twins. Sometimes, it amazes me what people think is appropriate or okay to say to other people. 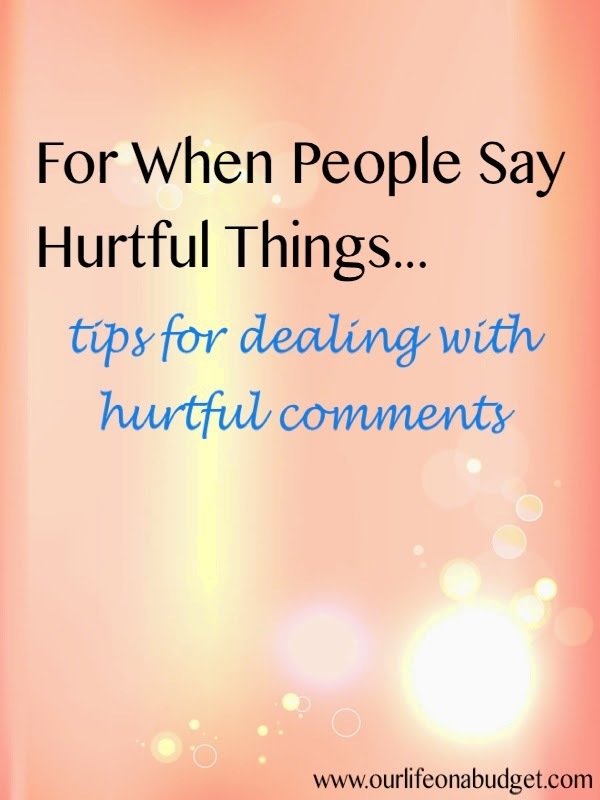 I think all of your responses are valid and appropriate for responding to hurtful comments without being confrontational or spiteful in return. Love this! Hi Stasia, I'm visiting from Essential Thing Link-up. So glad to find you. This is such a good post. We struggled with secondary infertility for many years, and some of the comments were very hurtful. Your advice is excellent. And I agree telling them gently that it's painful to talk about it is helpful for both parties. So often a hug is much more helpful than questions or advice. Would love to have you come over and link up at Counting My Blessings.